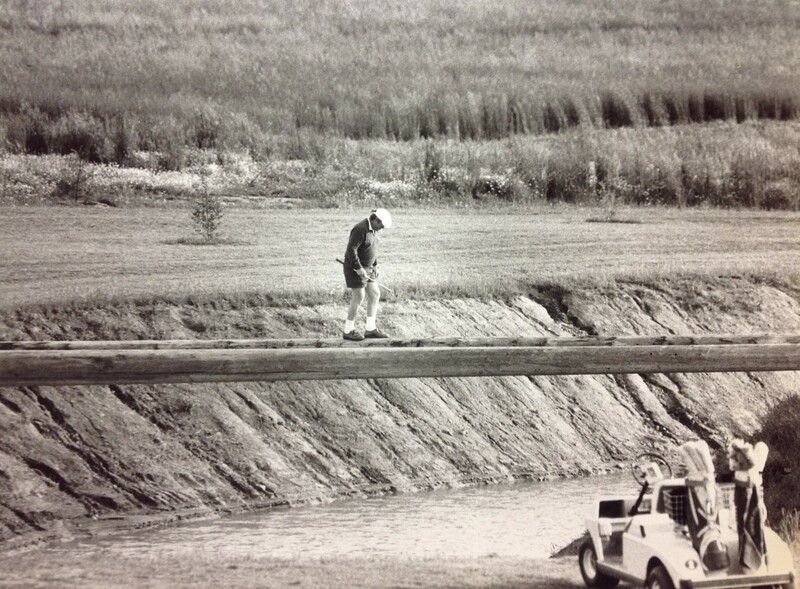 If you have ever golfed at Terry Hills, you are familiar with the bridge leading to the 14th green. It has become the iconic hole of the golf course, used in many of our marketing materials and so popular with brides and grooms for wedding pictures. Now there is a new bridge! When the second nine holes were constructed, number 14 was to have a green mostly surrounded by water. You could still get to the green without a bridge, but why not build a bridge! So in 1986 two very large telephone poles were delivered to the area and the bridge came to life. 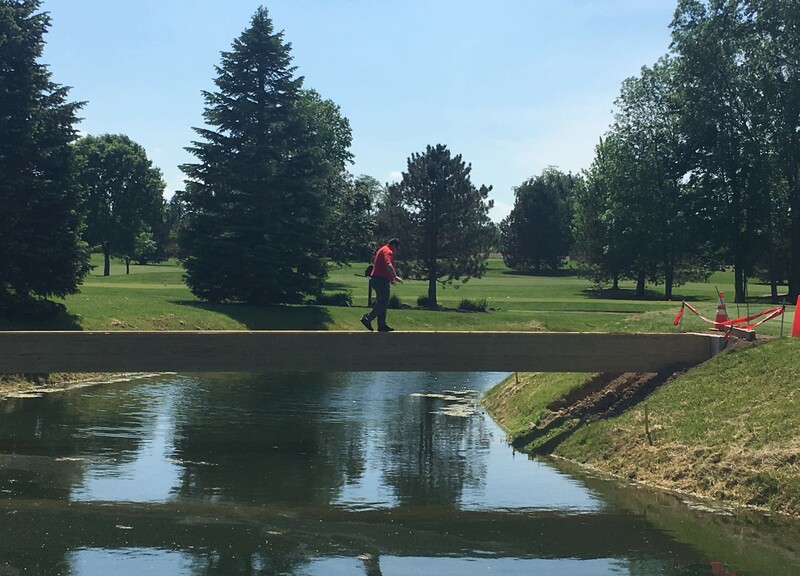 This walking bridge served the 14th green for 32 years, but weather took its toll on it and it was taken down this spring. Building a bridge looks quite different in 2018 than it did in 1986, with cement embankments, glulam beams and Trex® decking it is engineered to last. While it may look different, it serves the same purpose and is still one of Terry Hill’s signature holes. 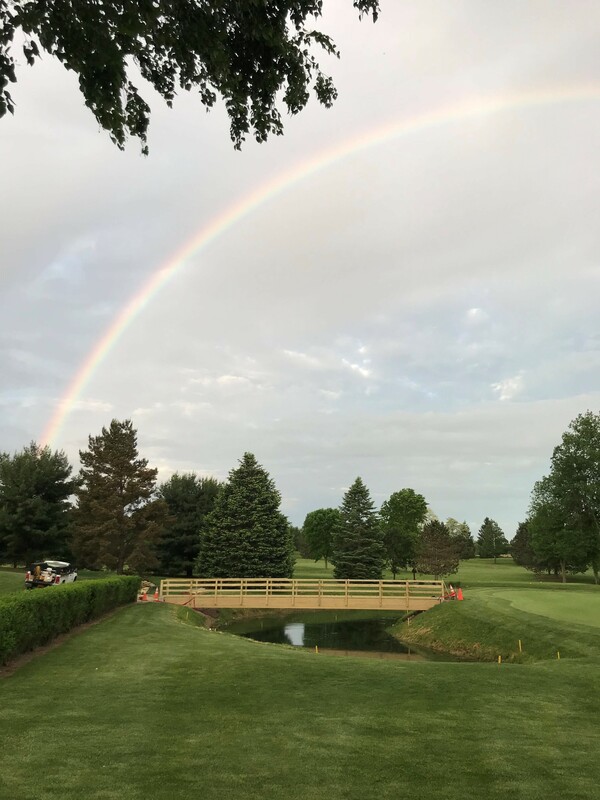 When the original bridge was constructed in 1986, Tom Brown, husband of owner Mary Rotondo Brown, walked across the telephone pole and this year, his son, Casey Brown, Head Golf Professional, walked across the beam. You can view a gallery of the project photos HERE. Our next installment of wine dinners was the Harvest Wine & Food Dinner on November 1st. This sold out event featured five delicious courses paired with five amazing wines highlighting the unique flavors of fall. The festive room was filled with good food, good conversation, good wine and great friends. Wine tidbits and information were shared throughout the evening, but not to worry, there were prizes for those paying attention! In asking Head Chef, Mike Devay, what inspired him for the menu, he said “I love to eat, so it’s only natural that Thanksgiving is my favorite holiday!” This is the third wine dinner for Chef Devay and he chose to theme it around the upcoming holiday. “Every time we do one of these dinners, I try to bring new and creative courses to the table that most people haven’t tried or don’t think would taste good”, stated Chef. He sure hit that one on the head this time around! The hors d’oeuvres course was a selection of cheeses donated by Cabot. The extra sharp and seriously sharp cheddars, pepper jack and Farmhouse Reserve Aged cheddar were paired with William Wycliff Brut Champagne. The champagne’s crisp, fruity flavor paired well with the bold and tangy cheeses. The second course really shocked a lot of the guests – brussel sprouts! Not what you think, it was a brussel sprout salad! Chef Devay is not a huge fan of brussel sprouts either, but thought serving them in this fashion was more appealing. The shaved, raw brussel sprouts were served with a sweet and savory maple bacon vinaigrette dressing. It was a hit! This course was paired with B & G Macon Villages Chardonnay. This well rounded Chardonnay had a fruity nose with hints of golden apple and a touch of honey. Light and citrusy with a smooth finish made this a match made in heaven! Next was pumpkin alfredo tortellini, a yummy cheese stuffed tortellini in a pumpkin alfredo sauce garnished with fried sage. This course was the most troublesome for our Chef. The intention was to have a hint of pumpkin followed by alfredo, but the first attempt tasted like pumpkin pie! He chose to switch the pasta to the tortellini and once he fine-tuned the sauce, the end result was delicious. The fried sage brought in another texture and complimented the dish quite well. This course was paired with Copper Ridge Merlot. Not the first choice of wine for this course, but when the one we ordered didn’t deliver, we had to improvise. Most comments were about the same as when they heard they were eating brussel sprouts; “no way” and “I don’t like…Merlot”, but the wine paired perfectly. The dark cherry flavor with hints of vanilla and spice and silky finish enhanced the nutty richness of the sauce and surprised most guests how well they went together. Course number three was stuffed turkey tenderloin. This dinner wouldn’t have been what it was without this course. The turkey, a staple for a Thanksgiving inspired meal, was an easy choice. To make it extra special, the bread stuffing had fresh cranberries incorporated into it and the gravy was infused with cranberry as well to give it a touch of tartness. What turkey dish would be complete without mashed potatoes? That is where the cauliflower mashed came in, yes cauliflower! Boiled down, a little butter, salt and pepper and there you have it! The rich flavors of this course were enhanced by Hangtime Pinot Noir. Grapes for this wine were given extended “hangtime” and harvested at peak ripeness, hence the name! This wine exhibits a rich garnet color with aromas of dark cherry, dried cranberry, and hints of allspice. The silky mouthfeel and supple tannins contribute to a long and satisfying finish. Just say “yum”! The dessert course – people are still talking about the dessert course!! Caramel apple puff pastry! Chef Devay admittedly loves sweets and loves to bake. “This was my favorite course”; says Chef Devay. You can be over the top creative when it comes to dessert and “over the top awesome” this one was! Chef made a homemade caramel sauce and mixed it with the apples and cinnamon slurry, wrapped it all in a puff pastry and baked it. Topped it with more caramel (because you can never have enough caramel) and finished it with homemade cinnamon whip cream. Yes - it was as amazing as it sounds! Paired with Crios Malbec full of jammy fruit flavors and subtle hints of coffee and vanilla made it a perfect ending. Another wine dinner in the books! We hope to see you at the next one. Another Guest Blog Post by Jim LaBuda, Assistant Golf Pro, recapping last week's Can-Am Cup . . .
Terry Hills hosted the 11th Annual Louie and Richie Can-Am Cup on Monday, September 25th, 2017. The match play style tournament consisted of a Canadian team and an American team with 41 players on each. The teams were made of up ladies, men and couples at all skill levels. The Canadian team has been the defending champions for the last 3 years. On this beautiful fall day with temperature in the mid 80’s, the American team was looking to upset their winning streak. Myself and fellow Terry Hills employee, Eric Holliday, partnered up for the American team. Eric was matched up with Canadian opponent Smokey and my opponent was Wayne, a member of the Canadian PGA. We started on the 10th hole, playing the North course first. On our first 9 holes, Eric bested Smokey to earn a point for the US side. I ultimately lost to Wayne on the 9th hole earning him a point for the Canadian team. We set our sights on the east course for the next 9 holes. Both matches came down to the 18th hole. Smokey was victor over Eric this time to earn a point for the Canadians and I was, once again, defeated on the 18th hole. Although I was disheartened by not winning a point for the American team, I enjoyed the friendly nature of the competition with our neighbors to the North. The overall final results had the US Team with 45 ½ points and the Canadian team with 39 ½ points. After three years, the US team finally broke the streak of the Canadian team and emerged victorious! No matter if you won or lost your match, it was a good time for all and new acquaintances and friendships were made. Many players told me that they had such an amazing time playing in this event that they are already looking forward to next year! I would like to personally thank Bill Cooper and Ralph Biamonte from the Canadian team for all their work in recruiting Canadian players, arranging their 2 person teams, and taking care of the logistics to come to Terry Hills for this event. In closing, this event is named in honor of Louie Fiorella and Richie Melrose. Before their passing, both men were avid golfers that played in the Can Am Cup for years. All who play continue to do so in their memory. Now that we've introduced you to our new Assistant Golf Pro, Jim, we wanted to give him the reins from time to time with our blog. 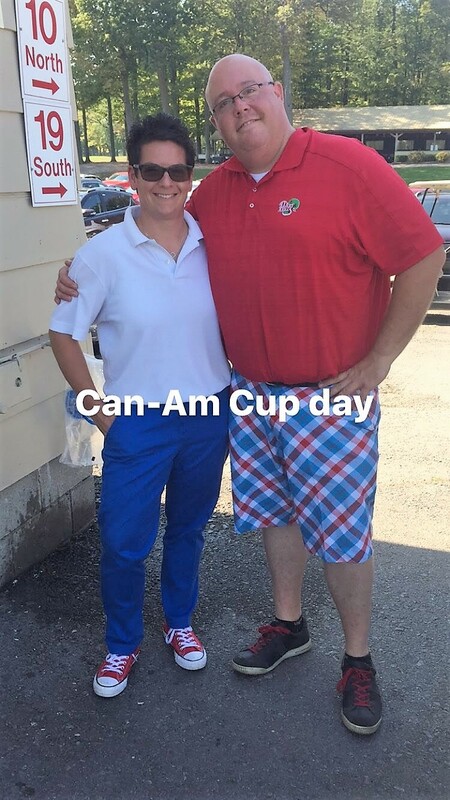 Here's his first Guest Blog Post, recapping this past weekend's Solheim Cup, a Europe vs. USA-style match, which parallels our upcoming Can-Am Cup! In dramatic fashion this past weekend, Team USA defeated Team Europe by a score of 16 1/2 -11 1/2 at the Des Moines Golf and Country Club in West Des Moines, IA to retain the Solheim Cup. This marks the 2nd consecutive victory for captain Juli Inkster who also led Team USA to victory in 2015 at the biennial matches held in Germany. Team USA wanted to start off strong this past Friday so in the first match of morning foursomes (alternate shot) they sent out the team of Lexi Thompson and Cristie Kerr to face Team Eurpoe's Mel Reid and Charlie Hull. Team USA could not have asked for a better start! Lexi Thompson led off the match hitting her tee shot on the 306 yard opening hole and driving the green! She didn't hit a driver, but instead hit a 3 wood on the opening hole and the ball stopped 9 feet short of the hole. Cristie Kerr then made the 9 foot eagle putt to give Team USA an early 1 UP lead in this match. I have to give credit to the team of Mel Reid and Charlie Hull. This was Reid's 2nd appearance in a Solheim Cup and Hull's 3rd appearance. To be matched up against the team of Lexi Thompson and Cristie Kerr in the opening match of the 2017 Solheim Cup on US soil had to be extremely intimidating. Then to see Lexi drive the green with her 3 wood and have Cristie make the eagle putt, I can't imagine what might have been going through their minds at this point. Team USA wanted to set the tone for these matches and let Team Europe know that they were going to come out and play aggressive golf. They weren't going to sit back and let Team Europe hand them the Solheim Cup; Team USA was going to go out and make sure that they controlled their own destiny. They wanted to retain the Cup and win the matches on US Soil which they went out and did. However, after 9 holes of this first match, Team Europe battled back to hold a 1 UP lead over Team USA. The matched ended up being halved with both teams earning 1/2 point. Sunday's singles matches also showed us some excellent golf and taught us a valuable lesson that we can all use to help our golf games. In the first singles match on Sunday, Team USA's Lexi Thompson was playing Team Europe's Anna Nordqvist from Sweden. Team Europe was down at the start of the day but a score of 10 1/2 to 5 1/2. If Team Europe was to come out victorious in the Solheim Cup they would need to have a record setting comeback. Anna Nordvqvist started out with 4 straight birdies on the first 4 holes and opened up a 4 UP lead after 9 holes in this first match. However, Lexi Thompson wasn't going to be defeated so easily. She stuck to her game plan of playing aggressive and birdied the 10th and 11th holes to win these holes and bring the match to a 2 UP lead for Team Europe. Lexi them played the next 7 holes in 3 under par and ended up having the match with Anna Nordqvist. This gave both Team USA and Team Europe a 1/2 point and started Team USA's victory run. 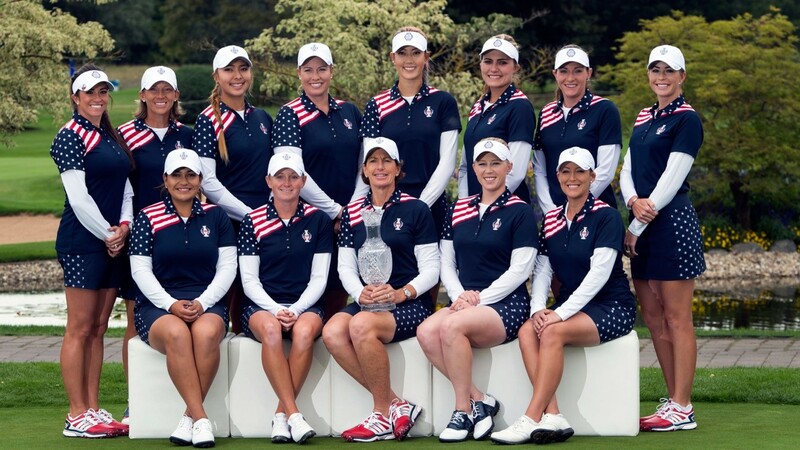 Golfers today can learn a valuable lesson from both team's from this past Solheim Cup. On Friday, the team of Mel Reid and Charley Hull could have been emotionally down after the 1st hole with Team USA making an opening eagle in such dramatic fashion. Lexi Thompson, one of the LPGA's stars and longest hitters drivers the opening hole with a 3 wood and then Christe Kerr, an LPGA star and veteran of the Solheim Cup, calmly walks up and knocks in the eagle putt. The USA crowd was going absolutely crazy when this putt went into the hole! However, Team Europe didn't seem to be bothered by this. Then on Sunday, Anna Nordqvist starts off with 4 straight birdies in her singles match against Lexi Thompson. Lexi was 4 down after 9 holes but then rallied to change the tune of the match and eventually halved the match with Anna. As a golf instructor and psychology coach, I work with players of all skill levels. One of the most important lessons is to "stay in the present." This means to circumvent feelings of intimidation or discouragement when an opponent out plays you on a hole. You need to focus on the mental side of the game as much as the physical playing aspect. Both Team Europe on Friday and Lexi Thompson on Sunday could have easily felt deflated after the first hole Friday and 9 holes on Sunday respectively. However, there was still a lot of golf to be played, they knew anything could happen and stuck to their original game strategy. This is something that all golfers can learn from. A great shot on one hole could easily be followed by a misstep on the next. The fundamentals for any golfer is to not over think that last bad shot. You can’t change the past and successful golfers know staying in the present and focusing on the shot going forward is how they ultimately succeed in the end. As golfers, we need to have very short memories and put what happened in the past behind us. We are in control of our own golf game and we should all play within ourselves. Play to your strengths. If you aren't the longest driver of the golf ball don't try to reach the par 5 holes in 2 shots just because your playing partners are. Don't try to hit an iron on a long par 3 if hitting a hybrid or a fairway wood is a more comfortable shot for you. On Friday, Charley Hull didn't try to hit a 3 wood to 9 feet on the first green just because Lexi Thompson did. She played within herself and hit the golf shot that she knew she could hit. Yes, she was down after the first hole but they stuck to their game plan, stayed within themselves and ended up halving the match with Team USA. Meet our NEW Assistant Golf Pro! We are very excited to welcome you to the newest member of our golf team! 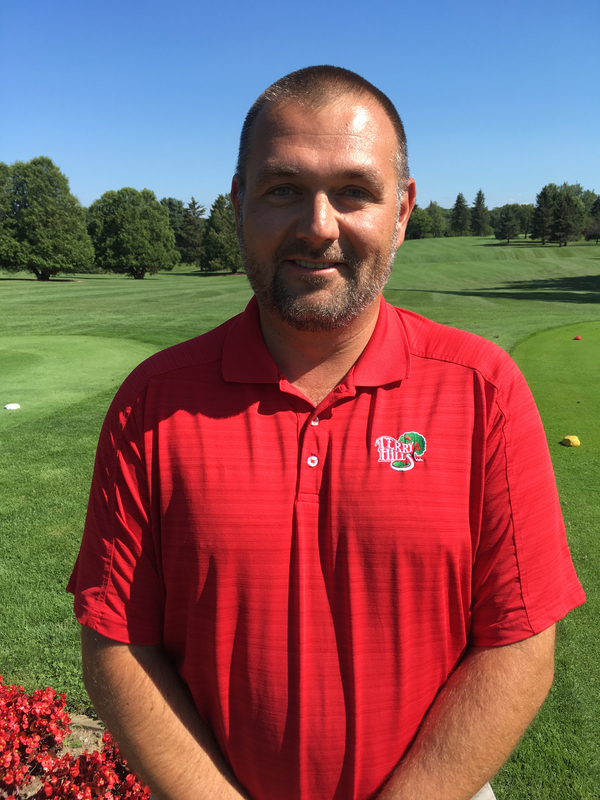 Meet Jim LaBuda, our new Assistant Golf Professional. Jim has lived in the Buffalo, NY area his entire life, with more than 20 years of experience in the golf industry. In high school, he began working as an attendant at a retail golf store. He then played Division I golf for Canisius College while pursuing a degree in Finance. Upon graduating, he followed his degree to a career in Finance, but didn't let his love of golf fall by the wayside. He completed the courses necessary to become a golf teacher as part of the USGTF, and passed the written exam and the Playing Ability Test to become a Certified Golf Teaching Professional. Eventually, he left the realm of Finance, and took up his passion for golf as a full-time career, which in his words is a "dream come true!" Beyond having another golf professional to assist with the day-to-day operations, we're also excited to be able to now offer Certified Golf Lessons to our customers. Jim is not only USGTF Certified, he's also a Certified Golf Psychology Coach and a RST Swing System Certified Instructor. He offers lessons for every skill level, as well as individual, group, and junior lessons. For more information, click here. Favorite Hole at Terry Hills? My favorite hole would have to be the 18th hole. I love the challenge and reward potential of the par 5. Your drive is key for getting to the green in 2 shots. It's not an easy up and down to save par. It's a great finishing hole for those 9 holes. My family and I love Walt Disney World. We have been there for every season at least once. Our favorite times are around Halloween and Christmas because everything is lit up and decorated for that holiday. The decorations and displays are quite extravagant and it’s an amazing sight to see. We also enjoy the time around the Food and Wine festival in EPCOT. It’s a world culinary experience all in one place. I love making anything on the grill, but my wife tells me that my best dish is my Vodka Pasta. If you had to pick any TV show to binge watch, what would it be? I love adventure so I’m currently hooked on Expedition Unknown. Otherwise, anything on the Travel Channel works for me. Biggest challenge facing the golf industry? I believe the biggest challenge facing the golf industry right now is attracting younger players to the game, especially in an area that is seasonal with very cold Winter months. It’s evident that with the emergence of smart phones and technological advances in gaming that kids have moved from active lifestyles to more sedentary. There just aren’t as many junior golfers playing as there have been in years past. We need creative and affordable programs to introduce the younger players to the game to show them that while golf can be a challenging game it is also fun and rewarding. What are you most excited for in your new role at Terry Hills? I'm excited to have the opportunity to work at WNY’s number one public golf course. I always enjoy meeting new people that love the game as much as I do. The learning experience is invaluable and the dedication of every staff member here at Terry Hills to their customers is unmatched to other places I have been. 5 Things We've Never Had to do in February.. Until Now. Employee Spotlight: Our NEW Head Chef!